The Puerto Rico National Guard C-130 was approaching Luis Muñoz Marín Airport carrying evacuees from St. Maarten in the aftermath of Hurricane Irma. Gus Phillips had been vacationing in St. Maarten feeling lucky he was alive to talk to the young man beside him. Time Traveler Martin Fields was satisfied after he’d sent those ancient pirates back to 1665, that no one realized who they were. Hurricane Irma spawned a very real time storm which dumped those buccaneers into 2017 during the worst hurricane in recorded history. I wrote this for the What Pegman Saw photo fiction challenge. The idea is to take a Google street image of a specific location and use it as the inspiration for creating a piece of flash fiction no more than 150 words long. My word count is 150. Today, the Pegman takes us to San Juan, Puerto Rico. Given recent events, it was impossible for me to not write about the aftermath of Hurricane Irma. 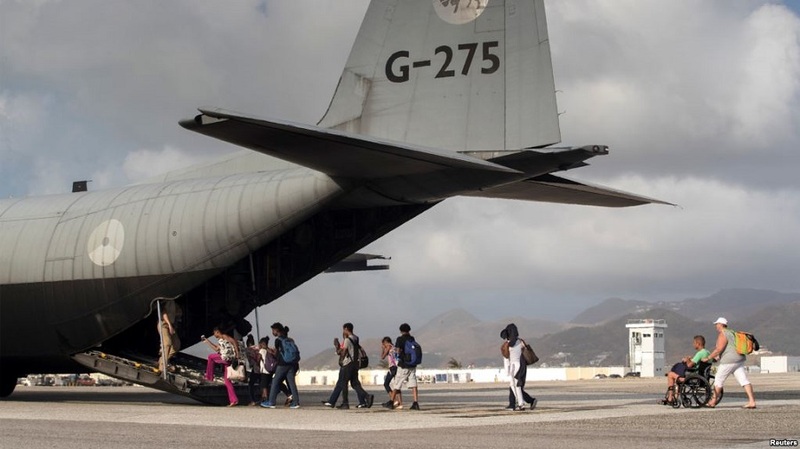 I learned that the Puetro Rico Air National Guard was helping evacuate people from nearby islands, and that on St. Maarten, there were numerous reports of lawlessness, including men with swords in a hotel lobby. It’s been over six months since I wrote a time travel story featuring Martin Fields, but this seemed like the sort of situation that would be right up his alley. The “time storm” concept I took from my current set of tales I’m writing as a homage to the works of Andre Norton (Alice Mary Norton). The next Martin Fields and NaCumbea adventure is I’m Leaving You For 1966, Dear. Love how you incorporated current events along with the prompt and took it to a whole different place and time. Like pirates of the Caribbean only more raw–indeed! Sounds like the situation in St. Marten is not good. Actually, I feel like I’ve cheated a bit because I didn’t actually use a Google maps image, just the location, and even then, the plane hadn’t touched down in San Juan by the time my story ended. I wanted to do something more than just write a story about human suffering. The flash fiction piece I wrote earlier today addressed that theme. Once I heard about men with swords, I had my angle. Pirates and time travel – that’s a heady mixture, James! I’m glad those swords weren’t used! So Irma caused more damage than can be immediately see – a time storm on top of everything else. Nice one! Thanks. There’s a 1980 movie called The Final Countdown about a modern US aircraft carrier based out of Hawaii that’s caught in a strange storm and transported back to 1941 just days before the Japanese attack on Pearl Harbor. The question is, should they warn Pearl Harbor of the impending attack and change history or, as a US Navy ship, should they defend against the Japanese? Not the greatest film in the world, but a lot of fun. It’s a long time since I saw it but as I recall they decided to go back home and leave history alone. Actually, the time storm returned just as they were about to engage the fleet of Japanese fighters. The Navy jets had to make it back to the aircraft carrier before they were stranded in the past. There was a historian who was stranded on an island with a woman from that time. At the very end of the movie when the carrier returned to Pearl Harbor in 1980, it was discovered that they were the patrons of the original mission. Of course, they were now elderly, but had leveraged their knowledge of the future to make millions.